The second night on the island stage brought two completely contrasted visions of contemporary jazz from opposite sides of the Atlantic. Marcin Wasilewski's regular trio with bassist Slawomir Kurkiewicz and drummer Michal Miskiewicz brought material from their third ECM album Faithful (2011) such as the upbeat, motoric, Night Train To You and their soothing, rhapsodic, rubato version of Hanns Eisler's "An den kleinen Radioapparat", plus re-workings of Bach keyboard pieces. The Valamar Festival audience were palpably being drawn in - on not the warmest of nights - to the trio's delicate art. For an outdoor stage, the vibe was surprisingly intimate, but there again, the sound balance in the first 15-20 rows of seats is superb. For the second set, the Buster Williams Quartet gave the American flip-side of contemporary jazz. This was a more energetic set, but one which was more reliant on a knowledge of the jazz canon. The American tradition in jazz is to show veneration not just for the canin, but also for elder statesmen, such as the seventy-one year old bassist and bandleader. He is the commanding figure onstage, and the younger players left him all the space he needed to project. The picture here, however, published on saxophonist Mark Gross's Twitter feed, and taken by him, shows the other three members of the quartet getting into the festival's holiday spirit. The Blue Taxis boat firm let the passengers briefly take the helm, and who could be more deserving occasionally to steer the ship than that propulsive pianist Eric Reed, seen here doing exactly that? His moments of gospelly extroversion in the band's set last night were among the highlights; and if Cindy Blackman-Santana looks completely relaxed here, her driving, building final solo on I Didn't Know What Time It Was built carefully to a massive climax, and completely won over the late-night audience. A third aspect of the scene came to the fore in the afterparty in the grounds of the Villa Polesini. 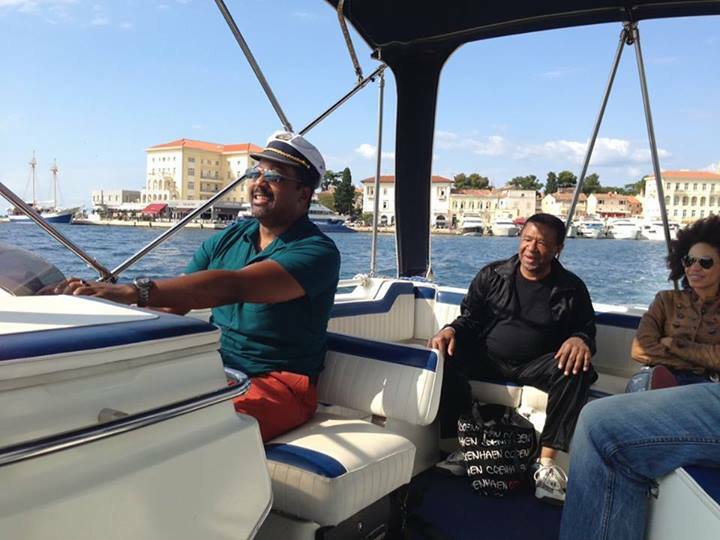 This was an occasion to showcase a group of musicians resident in Croatia. Festival Director Tamara Obrovac, a singer of considerable renown, is plugged into the scene here, and has a particularly sure step when it comes to choosing the bands to appear in this slot. I heard some great players last night, such as the fine, fluent, fascinating Russian tenor saxophonist Igor Kireyev, who now makes his home in Pula, an hour south of here. 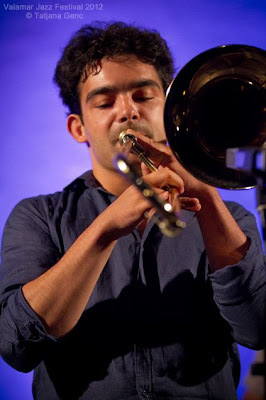 Also featured was trombonist Luka Žužić who has a fabulous sound, is a fluent soloist but also blends in brilliantly, and as last year, the subtle yet authoritative Rijeka-based guitarist Elvis Penava. They were part of a band who deserve promotion to the main stage, and would be at hme on jazz stages anywhere in the world. Having said that, the gardens of the Villa Polesini are a completely unforgettable, unique place to hear music. There are (probably Roman?) pillars at one edge of the stage. This must be one of the very greatest late night jazz hangs in the world, and I for one feel privileged just to be here.